At first glance it's easy to agree that Little and Ross's Gulls appear to have some shared derived traits, especially in juvenile plumage. However, these two are each placed in their own, montoypic, genera by the AOU. 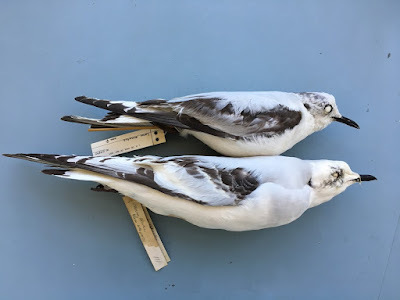 Little Gull is a hooded (or masked gull) and shows unique osteological features. Ross's is without a hood and has been under Rhodostethia for as long as anyone can remember. Little was placed in Larus for over 100 years until recently, and is now Hydrocoloeus. 1st Cycle Female Little Gull (top) and 1st Cycle Male Ross's Gull (bottom). Although males average bigger bills than female conspecifics, this male ROGU still comes up short. Here are the numbers: Male/Female ROGU average bill size 19.6/19.2 mm; Male/Female LIGU average bill size 23.2/22.9 mm (Olsen & Larsson 2003).